I seem to sway back and forth between my artistic obsessions. One week, crochet. Next week, doodling. Then, writing, music, dancing, and anything in between. Anything can strike my fancy at any particular time. If only I could stick to one and find a lovely, unique, little niche for my blog (along with the mom stuff). That'd be nice. 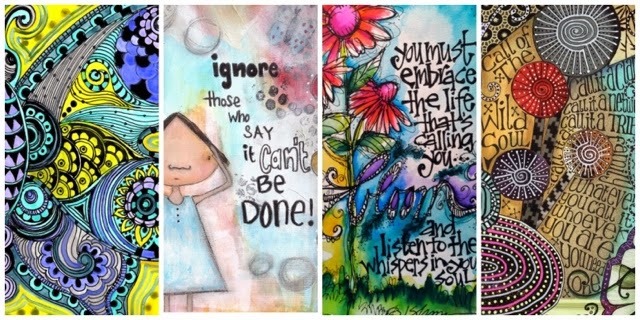 But that won't happen today, because today I'm back into Smash Books, Mixed-Media Journaling, and Doodling! It's been great for my anxiety. I'm practicing drawing faces, characters, and anything that strikes my fancy -- like E's plate of macaroni & cheese and green beans. E is also really into painting and coloring right now, so I'm getting more opportunities to sit down with my little sketchbook and do a doodle or sketch each day. It's all in the name of practice and fun, and I'm enjoying the process. I'm keeping a handful of journals on hand for everything I'd like to keep track of -- my schedule, design/blog ideas, sketches/doodling, dream notes, visions, random thoughts, etc. 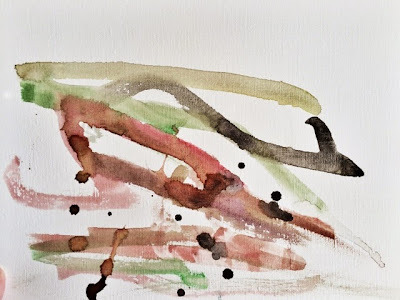 And I'm trying to worry less about the appearance and design of each page and more about documenting just for the sake of getting thoughts and ideas out of my head. It's been such a fun and therapeutic process. I can't wait until E is a little older and can better understand why this means so much to me, but for now I'm trying to learn from her. Her "let's just paint for the sake of putting pretty colors on paper" attitude is such an inspiration. Art. Simplified. The results are in! The good news is that I have NO food allergies or inflammation caused by anything I’m eating, except for maybe gluten and dairy just wreaking their usual havoc on my sensitive system. The bad news is that I have Crohn’s Disease. Not the end of the world, but ugh. Most normal people would probably start researching like crazy all the symptoms, medications, and side-effects, but I can’t quite get there yet. Mark has been the primary Googler, and he’s giving me information as I’m ready to hear it. I’m sipping on a Coke as I write this, even though my belly is probably going to reject it. More good news? I know what it is now. I know I’m not crazy. I know that… lying on the floor of a bathroom and blacking out from cramping isn’t “just anxiety” as other doctors have told me. My regular doctor is a super smart lady who insisted that the Specialist at Fletcher Allen do more tests, even when he said it wasn’t necessary (as I was being wheeled into the hospital). We caught it early, so we can take preventative steps to avoid scary things in the future, like colon cancer. A smidge of bad news? More tests (yuck) to make sure the Crohn’s isn’t causing any other complications in my intestines right now. Shocking news? The doctor wants to start me right away on medication that costs $400/month, to reduce the inflammation which can lead to other more serious complications. My insurance will cover a portion, but the hospital is petitioning the health insurance company to cover more (fingers crossed). It’s not even a “huge inconvenience” or a “shock to our bank account.” We simply do not have that kind of money to spend each month. How do people live with more serious illnesses? But right now, I’m just focusing on the fact that I’ve lived with this for about a year. The first episode was during E’s first birthday party. I can go a few more days or weeks without medication until we can figure out what to do. In the meantime, life goes on as usual. We’re not sweating the small stuff, and this is all small stuff! A Napkin. It's What's For Dinner. A pic from that day! Love this crew! Has it really been a week and a half since I’ve written? Please don’t give up on me, dear readers! I have no good excuse for my absence other than the usual busyness of life. If you’re a regular follower of our Instagram feed, you’ll know that we’ve been on the go, enjoying this warm weather, preparing to do more doodling/painting/music-playing, and organizing the apartment. All good things. But the one thing weighing on my mind this morning is something that happened a few weekends ago, and I could really use some mommy-input here. Did I do the right thing? 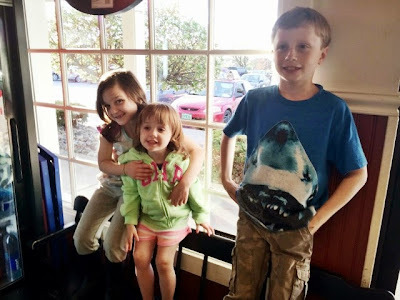 We went out to eat with my in-laws at a local pizza place, with 3 kids in tow, including E. It was your typical kid-chaos, which I’ve contentedly settled into – sweet, loud voices hollering, “When’s the food coming?” “Can I get a drink?” “I need a napkin!” and the stomping of sneakers against tile floor as all 3 found their places and prepared for a busy meal. My daughter, well-trained by day-care mealtime, fit right in. 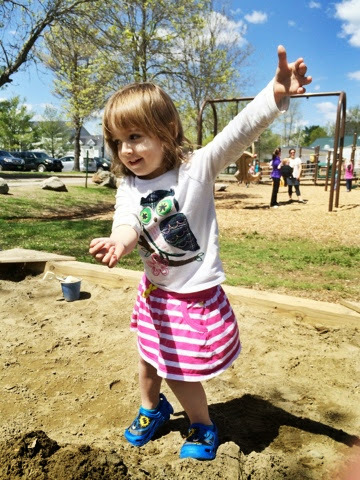 She had the same wiggle in her step as the rest, the same excitement in her eyes, and her head bobbed around to take in every fun detail of being out and about with her clan of cousins, parents, aunt, and uncle. I settled into my seat, sitting across from my bouncing, giggly toddler, and I smiled as I tried to calm her by focusing all her attention on one simple task – watching me cut a delicious slice of cheesy pizza. She climbed on her knees for a better view then hopped back down to a sitting position to get more comfortable – constantly moving. I happened to glance up, over her head, to a family sitting behind us. The mom gave me that look. You know the one – her eyes got big with… oh, what’s the word? Disapproval? Surprise? Sometimes I know immediately the reason why a fellow mother gives me this look. Usually it’s because my daughter is having a particularly difficult day and just happens to be swinging off some piece of fancy furniture or architecture in a public place, screeching like a pterodactyl. But this look caught me completely off-guard, because it was very deliberate (for one), and (two) I had no idea what triggered it. Other than the fact that my daughter was a little wiggly in her chair, and we were all being a little loud with typical mealtime excitement… (Me included. “More pizza, please!”), I just couldn’t come up with an explanation. I went on with my meal and wrote off the woman’s look as, I don’t know, indigestion, I guess? Her children sat, eating in silence. As the meal went on, the woman’s son, who I later learned was nine-months-old, started waving and smiling at my daughter. We waved and smiled back. I noticed that he was chewing on a wet napkin – the brown kind that they have at most restaurants. It was starting to fall apart. My mom anxiety kicked in, as I watched him slowly eat half the napkin. Both parents were on their cell phones (no judging here, we do the same sometimes). So, I let the kid enjoy his paper-meal. “It’s none of my business,” I told myself, “Ellie has eaten a few bites of napkin in her life, a nibble of paper-towel. She’s chewed on a playing card before.” I took a deep breath. Then the kid started to choke on what was left of the napkin. Gagging. Gasping for breath. My sister-in-law was watching, too, and she grabbed my arm. “Okay, now we have to say something, right?” I whispered to her. This wouldn’t be easy. I am not a judgmental mom, and I would never criticize another parent (except later, in the privacy of my own home, when Mark and I were lying in bed before falling asleep saying, “Oh my God, did you see that!?”). And, of course, if my intuition was right, I could already sense that this was the type of mom who seemed content judging every other family in the restaurant but would not take kindly to a “judgy” eye being turned on her – even though my only concern was for her son’s oxygen intake and digestive tract. I would have to tread lightly. I got up quickly, as if I was headed to get something at the front of the restaurant, and I casually put my hand on the arm of the gagging infant as I passed by. I said cheerily (and in an “Isn’t life grand! ?” tone), to get the father’s attention, “He sure is enjoying that napkin! Haha!” The father looked up from his phone and quickly pulled the napkin out of the baby’s throat. The mother looked horrified – not that her baby had been choking, I’m not sure she ever realized that – but that another mother had even passively mentioned, literally in passing, that her child was eating a napkin. She quickly jumped in to defend herself, “He’s fine!” she blurted. Then she tried to laugh off her knee-jerk reaction, “Ha! Well, you can tell that this is our second child! We're very relaxed about it.” The father was equally defensive and began listing the many nutritional qualities of paper napkins. 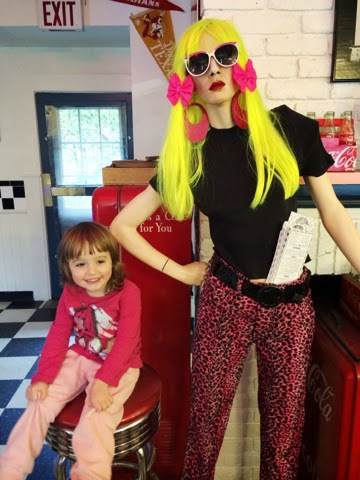 “Oh, my daughter has eaten her fair-share of napkins, too, and she’s my first!” I blurted, through forced laughter, trying to ease the tension. It all added up to one awkward situation that I quickly excused myself from. I made my way to the front of the restaurant where I faked needing a fork and rushed back to my table. I elbowed my sister-in-law to indicate relief in being done with that "Holy cow!" moment. The father turned back to his phone, and the child kept chewing his napkin. We’re all in this together. It’s okay if you let your toddler chew on napkins to allow yourself 5 minutes of freedom to check Facebook or read an important text message. I won’t judge. And it’s okay if you didn’t even know he was eating the napkin or choking on it. He’ll survive. And, if it looks like he might not survive, I’ll step in to help. The only thing I ask in return is that you not widen your eyes and look at me with disgust when I turn a blind eye to my wiggly, loud 2-year-old, so I can enjoy my same 5 minutes of peace. And maybe a kind word or smile would have helped. A look of knowing that we’re all fighting the same battle. What about you, moms? Have you had to step in to help another mom and been caught off guard by the reaction? I’d love to hear your stories! 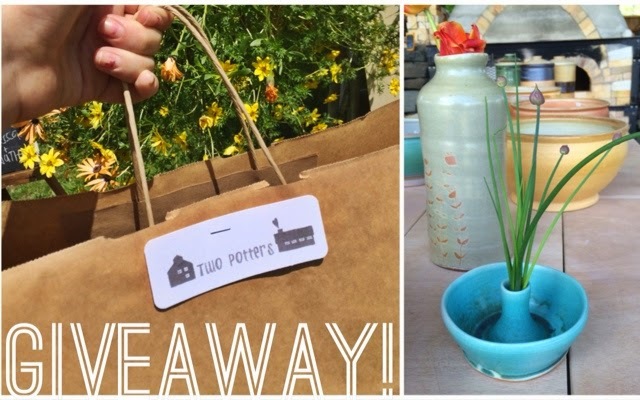 I am so incredibly honored and excited to host this giveaway from the Two Potters! This talented husband-and-wife team creates beautiful handmade bowls, vases, mugs, etc.! If you get a chance, visit their studio in Bethel, Vermont. We went to their Open House over the weekend, and it was beautiful! There are pics from the day on their blog, here! This vase is one of my favorite pieces that Becca generously donated. And this is your chance to win it for yourself! I've also made it easier to enter the raffle! See below! 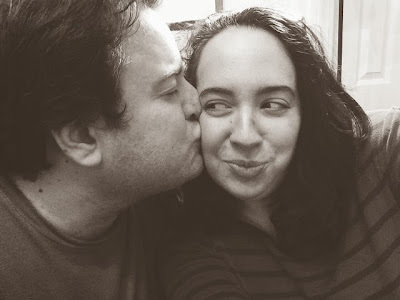 In honor of the upcoming Father’s Day holiday, and for the fine people at the Dollar Shave Club company, I’m writing this week to celebrate (early) my husband and our Super Dad, Mark. I’ve really struggled with what to write for this post – not that there is any shortage of qualities that Mark embodies that deserve celebrating. It’s just that… how do I sum up who Mark is as a father? How do I celebrate this guy who, as shown here, would never balk at wearing a toilet-paper-tube necklace made with such love and care by our sweet daughter? What’s the one thing that makes Mark rise above the rest? Of course, he plays with our daughter any time she asks and takes care of her with constant love and patience. He frequently goes above and beyond the call of duty by getting up with her at 2am or taking over for me when I’m sick or just having a “blah” day. Last weekend, he brought her shopping to buy new shoes, and brought her home with bright blue and yellow Batman Crocs. “She insisted,” he explained. Fine by me. But what really makes him stand out as a father, I think, is his sense of wonder and imagination. He is a philosopher, a writer, an actor. “Are you serious?” I yelled back. He laughed hysterically before finally admitting that yes, he was. I realized, especially in that moment, that he was gone, as in, completely submerged in this entire parenting thing. He makes marble tracks out of tape-measures and roads for Matchbox cars, and he’s just as happy to play house and baby dolls. He is smart and an expert answerer of all “why” questions, and I find myself looking up from cleaning poop off the floor and staring in wonder at this man who makes parenting fun, who makes me feel like a kid again, and who is raising our daughter to be smart and imaginative, an explorer and adventurer. He is our Super Dad, and I couldn’t be prouder of our little family. In design news, I've been playing around designing some new mommy calling cards that can also be customized for business cards, etc. I made some for YMIS, and I thought that I'd make some for everyone! Yay! 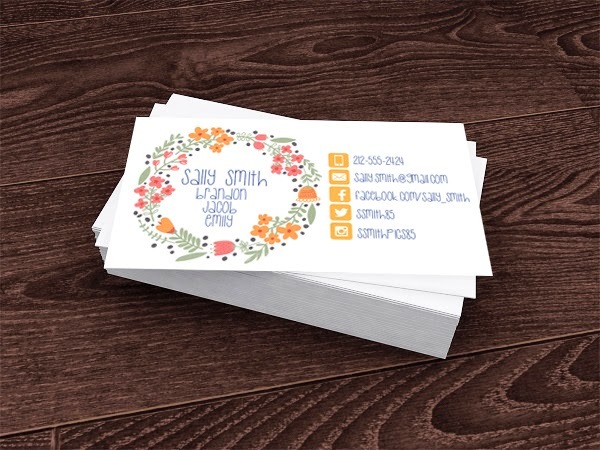 You can purchase these printable business cards from my Etsy shop, here! These are geared toward mommies, but if you like the design, I can customize them for your business or personal calling card. I've also updated my online portfolio with some new logos and a t-shirt design for a really great cause that I was honored to work on! Okay, so this is how I think prayer works, or at least how it works in my life. I equate it with meditation in many ways. Tomorrow, I have to have a colonoscopy. I debated about telling you all this, not because I have any shame in the matter but because I don't want to turn it into a big "thing," even for myself. My anxiety is getting the better of me -- mostly about the IV... ugh, needles, which I hate, and anything medical. As a control-freak, it's hard to let go and let someone else take care of you/do weird things to your body, even when I know that these biopsies are going to give me answers as to what my stomach is rejecting. 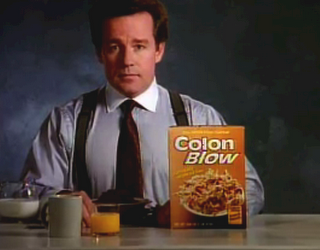 So, yesterday, I prayed to God, to my spirit guides, to the ever-encouraging image of Phil Hartman eating a huge bowl of Colon Blow, to help my anxiety go away. After praying, my first thought was that I needed to have more information. And not Googled information. Google is an anxiety death-trap. I was nervous about other things besides the needles, but I didn't realize this until I took some time to focus, to pray, to meditate, to think. First, I had to deal with all the unknown aspects. I stopped at Kinney's to pick up my prep kit. The woman announced to the entire store, "And... what is it you're here to pick up!?" "MY COLONOSCOPY KIT!" I yelled back. I have no shame. My toddler was behind me, climbing on the blood-pressure machine, yelling to the pharmacist technician something about eating boogers. She had taken apart (what I have named) the Automatic Hand Sanitizer Hand (dis)-Infecting Tray (the AHSHIT) in the waiting area and was using pieces of it to "make some cookies." I gave the woman my money, suddenly realizing that I was paying $12 for a deep cleansing of my bowels. Ugh. I turned back around to see that my child had found a large crayon basket, dumped the crayons on the floor, and had colored a (beautiful) mural on the tile floor and on the remaining pieces of the AHSHIT. There was also a cloud of poop smell around her. Miraculously, I was able to get her to put the crayons back and help clean up the mess. There were no tissues to wipe up the puddle of sanitizer under the missing AHSHIT, so I reassembled it and squished it back into place on top of the sanitizer puddle, using the excess gel to clean my hands. When I got home, I got my little darling to watch a video while I sat on the couch and read through my information packet. I tried to breeze over the side-effects section, but certain words jumped out at me: "seizures," "vomiting," and "sudden death." I felt my stomach tighten. I put in a call to the doctor's office to ask the logical questions -- if it's okay to take certain medications during the prep, etc. Meanwhile, I noticed that the information from the pharmacy didn't include when and how much of the prep solution I should take, so I called the prep-line at the hospital. An abrupt woman gave me the information, then said, "Well, I don't really know... let me check." I felt my stomach muscles tighten more and ran to the bathroom to get sick while I waited for her to return. When she came back to the phone, I tried to sound like I hadn't just gotten violently ill. I politely ended the call and debated cancelling my call to the doctor's office, since I had the information I needed, but I didn't. I thought, it couldn't hurt to have another office's opinion. A few minutes later, a nurse called -- Nikki. It was the nurse who was on call throughout my entire pregnancy. She's the one who listened to all my questions like, "What is this funny, little pinch on my left side, when I get up out of my chair?" and answered sweetly with, "I don't know, but I'm sure it's fine." "Nikki," I said, "You know me. I'm reading through these side effects, and I'm freaking out. I'm seeing that 'seizures' and 'sudden death' are on the menu, and I can't deal." And, do you know what that angel told me? She said, "Gretchin. In all my years of doing this, I have never seen anyone have seizures or die from taking this laxative. I want you to stay close to the toilet and have a good book ready. That's all you have to do." And I said, "Oh, Nikki, it's so good to hear your voice. You were my voice of reason throughout my entire pregnancy, and I feel so much better after talking to you." Sometimes prayer feels like a two-way street in which God meets me halfway, giving me the tools I need to cross the street, changing the streetlights at just the right time, and being my friend waiting at the other side, but I have to take the first step. Don't get me wrong, I think prayer can also trigger miracles, shake the ground, and break the laws of the universe, but if that happened every day, exactly when we needed it to, it'd be a little bit like a superhero movie around here... because Lord knows I'd be praying for flying powers, a Hobbit house, doves to follow me everywhere I go, and green-bean casserole every night for dinner. Sometimes answered prayer is a knowing, a feeling, a calmness that we have the power to fix things, to let God and positive energy move through our lives and work through us. And now I prepare for the "spirit" to move through me. Tonight is prep. Tomorrow is D-Day. We had a great biking day yesterday! I picked up E at day care, and we rode to the park. It was about 2 miles round-trip, pretty short for a bike ride, but wow! I felt it -- especially with a 35lb. toddler on the back of my bike. The way back was mostly up-hill, and I thought I wouldn't make it. Haha! But we did great, and E loved it! I think we'll try a more-level bike path next, but it looks like rain today, and my back needs a day of rest. So, yoga is on the schedule this afternoon! As you can see from the pic yesterday, E is quickly outgrowing the bike seat, so I'm also hoping to rent a cart next to pull E along behind me. Though, I am hoping we can get a few more weeks out of this rig! Yesterday, we rode past some landscapers, and a guy yelled, "Hey, can I have a ride?" and I didn't know if he was just being funny or alluding to the fact that I was basically sitting on E's lap. Boys are weird. Regardless, this is working great for us, and I can't wait to get back out there! Sorry for my lack of posting this week, lovely readers! I busted out two posts for the BVT Moms blog that should be up by the end of the month! I can't wait for you to read about How I Became a Mommy and How to Survive Restaurants (and Outings) with your Baby/Toddler! Oh, and (looks at my calendar)... Is it Throw-Back Thursday again already? I'm running out of old pics of me to post...! How about one from 2012? 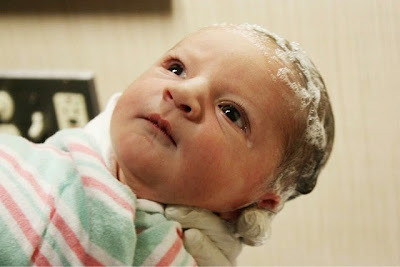 This is my beautiful baby in the hospital, getting her first shampoo! She loves this picture of herself and makes me tell her over and over again the story about how they first gave her a bath in the hospital, how the nurse swaddled her then stuck her head under the faucet to wash her hair. She was always so alert and curious about everything going on around her! She still is... my little back-seat driver, kitchen-helper, and miniature care-giver. She helps take care of all of us! In other news, I got my Mother's Day present early! I told Mark that I wanted to pick up a bike. This always seems easier in my optimistic, little, innocent mind. I did not plan on spending 3 hours at the sporting goods store with a cranky, hungry toddler who filled two diapers and insisted that we "find a snack somewhere." Still, we got to see planes at the airport and have a snack at Starbucks. And, at the end of it, I got my bike. Mark came up after work to put the bike rack on the car, and before I knew it, we were riding in style! 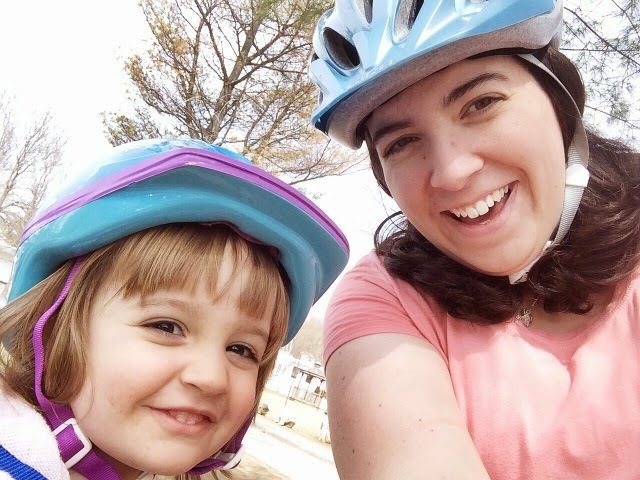 E and I gave it a quick test run in the parking lot (we'll both be wearing helmets for our "real" ride today), and I ran off to the Mommy Foodie Fair in Burlington. It was a great day and evening, and E woke up this morning excited to go to day care and wait for me to pick her up with the bike. The seat on this bike is a little awkward, but the balance is better with her seat closer to mine. Unfortunately, it looks a bit like I'm sitting on her lap and that her little legs could snap off under the weight of my big bottom at any moment... but ah well, we're happy, and this will get us through the next few months of summer. We can also rent a cart at the local bike shop if I want to pull her along behind me for longer rides. In other, other news... I sat down with E at the table the other day, and she asked me to paint. We haven't painted in a few weeks, and it was bath night, so I said, "Sure!" I don't know if it's because she's spending more time painting with the preschoolers or if she's just becoming more particular about her painting technique, but she sat for a long time and made some gorgeous, new paintings! She hardly got any paint on herself and was so happy with her masterpieces. I'm proud of everything she does, but this painting is a particular favorite of mine. I love the colors and texture. This week, Mark and I use a random-topic generator to bring you 15 minutes of silliness. This is one of my favorite podcasts... Now we're off to watch Top Gear and SNL, then go to sleep! Hope you enjoy the last few hours of your weekend! That's Thank Freakin' Goodness It's Freakin' Friday! What a week! We're finally starting to return to a normal week after getting over these colds, and here comes Friday! I feel like it's been forever since I've written a really good Ellie story, but the inspiration just hasn't hit me in awhile. I think it's because every day is just filled with cuteness and Ellie-isms. Where would I begin? She has also been unbelievably compliant lately. In spite of a few expected rough days while being sick, I've been able to take her anywhere and do almost anything with her. We can go to restaurants, grocery stores, toy stores. She loves browsing and won't argue with me to buy her things we can't afford. I chalk this up to us spending hours out and about, with very little spending money, just to stay busy. And, in trying "just to stay busy," I've found that I really love my kid. I mean, of course I love her, but I actually enjoy spending time with her. 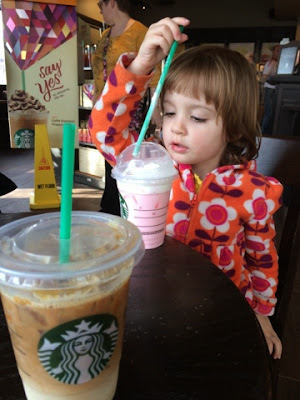 Yesterday, I took her to Starbucks, where the barista made her a special coffee -- half a shot of raspberry syrup in 2% milk with whipped cream on top. She was so happy, and even though I was ready to get back in the car and drive home, she insisted on grabbing a nearby table, sitting with her coffee, and talking about her day with me. She waved to every woman who came in the door and said, "Hello!" charming everyone she met. She chatted away and made me laugh. My little best friend! She's had a few rough days going to day care, but as long as I tell her our plan for the afternoon, and as long as those plans enjoy browsing any toy store or going for a walk or to the park, she's happy. That man has green shoes on! They're just so bee-yoo-tiful! Mommy!! Mommy! MAMA!!! Look!! Look, Mommy!! BIRDS! Can we go to a restaurant? All day, every day, cuteness surrounds me. I feel so blessed. ALSO! I finally got my bookshelves completed! Since my DIY (Do-It-Yourself) method failed miserably, I switched to my DIMS (Do-It-Martha-Stewart) method and bought a Martha Stewart brand bookcase from Home Depot. It was $45, but it saved me some time and energy, and I'm finally happy with how it looks! This is also the first "domino" in a long line of home-improvement dominoes in which I'm trying to make my home a place that I love to live in and keep clean. 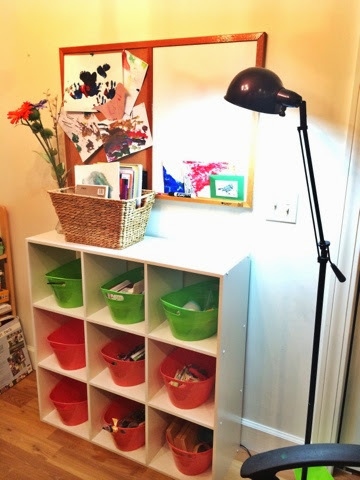 By doing this, I can move my craft stuff out of E's room. Each bin in our new system is one craft project that we can take out, use, then put away. It means that we'll have fewer "mixed-media" messes to clean up. Of course, we'll still get mixed-media crazy sometimes, but I'm hoping that the cleanup and organization will be much easier with this process. AND! Stay tuned in the coming weeks. 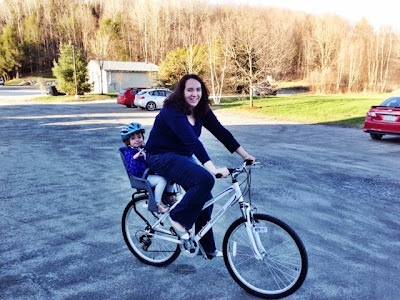 I'm writing two new posts for the BVT Moms Blog! One is about How I Became a Mommy (should go live between May 4th and 11th). The second is about how E and I have learned to love having Toddler Lunch/Dinner Dates and will include some creative tips for taking your toddler(s) out to restaurants (should go live in the third week of May). I can't wait! I'm loving writing for that blog! Ellie: The swand-wich was all gone!! And who was eating it, Mama?? A doggie!! Ellie: Om, nom, nom, nom! Me: So, Papa went back inside to tell Amy's mom, and she made Papa a new sandwich. Papa and Amy sat inside eating their sandwiches. Then Papa got peanut butter on his face, and he didn't have a napkin, so he wiped the peanut butter on Amy's Mom's new curtains... And Amy's mom said, "Don't wipe peanut butter on my curtains! Now you have to..."
Me: Yes! Her boot was still stuck way down in the snowbank. So, I went inside to get Papa, and he came out with a shovel and helped dig the boot out of the snow. These are always followed by, "Again!" So, we tell them over and over. I never get bored with it, because I could watch her little face light up over and over again as she imagines the story unfolding.